TALK about daredevil status ... and yes definitely do not try this kids. Incredible footage shows a kayaker today descending over the top of Dangar Falls in Dorrigo. The footage shows the nerve-racking moment kayaker Lachie Carracher paddled to the edge of the swollen river for the inevitable 30 metre drop. Kayaker Lachie Carracher takes on the 30 metre tall Dangar Falls. 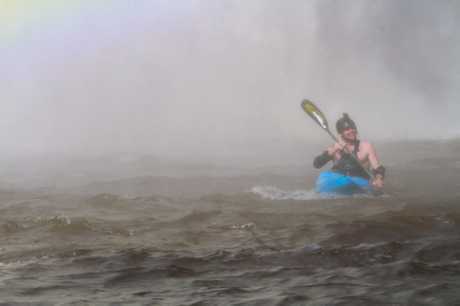 The gutsy effort is said to mark 'the first ever kayak descent of Dangar Falls' according to one commentator on the Facebook page. The face of Dangar Falls spans a height of around 30-metres. Mr Carracher, who was named the Australian Geographic Society's Young Adventurer of the Year in 2012, had travelled up from Victoria to take on the waterfall. Mr Carracher is an accomplished whitewater kayaker who has paddled several rivers around the world. Kayaker Lachie Carracher paddles over the top of Dangar Falls on the flooded Bielsdown River near Dorrigo. VIDEO: John McQueen. Dorrigo has this week recorded 182mm of rain, according to the Bureau of Meteorology.